Kilauea Volcano: is it safe to travel to Hawaii when it’s erupting? Is It Safe to Travel to Hawaii Any Time Soon? For the most part, the answer to the question of is it safe to travel to Hawaii during a volcanic eruption is yes. This may not sound totally reassuring, especially in light of the recent media buzz about it. But the 1.4 million people who live and work in Hawaii are mostly unaffected by the volcanic eruption. What’s amazing is that the volcano has been continuously erupting since 1983. Many are not aware that Kilauea Volcano on the Big Island of Hawaii has been actively spewing lava for over 35 years now. But as with many things, people only become more aware of it when the media calls attention to it. In this case, as of May 2018, there is new activity from a vent about 25 miles from Kilauea. This new activity has created lava flows threatening and engulfing many homes. What Areas of Hawaii Are Being Threatened? So far, slow moving lava flows have destroyed over 600 homes in the Pahoa area of the Big Island. Over the years, lava flows have burned down many other homes in this area as well as in neighboring Puna. So if you live in these areas, you should certainly be aware of the risks. Lava also flows within and from the craters in Hawaii Volcanoes National Park. But hardly anyone lives within the park. Lava field in Hawaii Volcanoes National Park. Additionally, one can only find current volcanic activity limited to the Big Island of Hawaii. Out of five so-called active volcanoes in the State of Hawaii, four are on the Big Island of Hawaii. 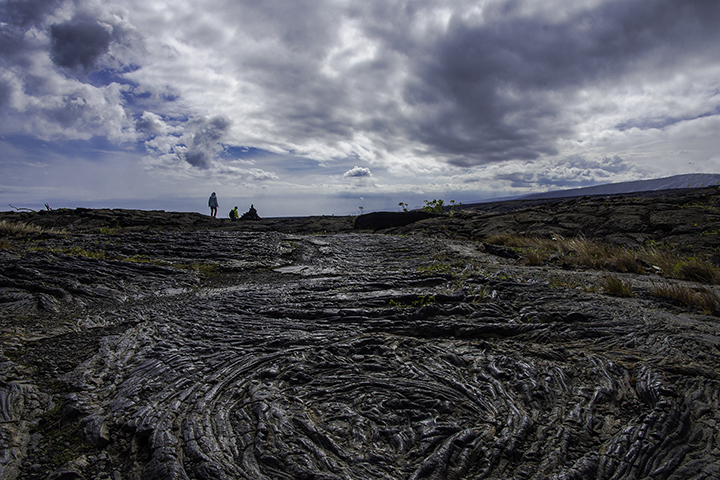 They are Mauna Loa, Hualalai, Kilauea and Loihi. Loihi still has not broken the surface of the ocean and won’t for thousands of years. The remaining one is Haleakala on the island Maui. But according to research, it hasn’t erupted since the 1790s. Lava flowing to the sea on the Big Island of Hawaii. Would You Be Danger if You Travel To Hawaii? There is actually little danger from volcanoes to almost all who live and visit Hawaii. Nevertheless, volcanoes in Hawaii can pose two types of threats to living things. They are the lava flows and vog. Here’s another fact to consider. Hawaii’s lava flows move very slowly. This is because Hawaii’s volcanoes are shield volcanoes. Shield volcanoes are characterized by slow moving lava activity. Shield volcanoes do not create spectacular explosions or deadly quick-moving pyroclastic flows. This would not be the kind you would find in composite volcanoes. Examples of deadly composite volcanoes include Mount St. Helens in Washington State, Mt. Etna in Italy or Mt. Pinatubo in the Philippines. Another more recent example is the damage caused by a composite volcano in Guatemala suddenly erupting on June 3, 2018. This eruption has killed hundreds of people in the country. Volcanic eruptions like the ones in Guatemala, Italy, the Philippines and elsewhere, do not occur in the Aloha State. So you would not be in any sort of immediate danger in Hawaii from a volcanic eruption. You definitely won’t be if you’re not visiting the Big Island. And even if you are, you won’t be unless you’re in the path of a lava flow or in close proximity to the eruptive activity. Furthermore, even if you are in the path of a lava flow on the Big Island, because it moves slowly, you should be able to safely walk away from it. So even if the lava flows have destroyed over 600 homes at this moment, it’s not surprising that there have not be any fatalities up to this point. But then, there’s the vog. Vog is smoke from the volcanic eruptions. It could potentially pose health problems for those with respiratory ailments, especially with those who have asthma. Then there is also the threat of toxic gas fumes. But this problem is limited to those in close proximity to the eruption and lava flows. Fortunately Hawaii’s trade winds, which come from the northwest, generally blow the vog away from the islands. But when there are Kona winds, which come from the southeast, they blow the vog towards the island, including all the neighboring islands. So when you’re on any island other than the Big Island, vog is the only impact that you’ll experience from the Big Island’s volcanic eruptions. Fortunately, the prevailing winds in the Aloha State are trade winds. So you won’t experience vog when you’re on any of the other islands, unless there are Kona winds. So overall, it’s always generally safe to travel to Hawaii, even with the volcanic eruptions. Remember now, it’s been continuously erupting since 1983. So this current eruption isn’t new, except that it has been threatening homes once again in remote areas that are prone to threats of lava flows. And this is not anything new either. 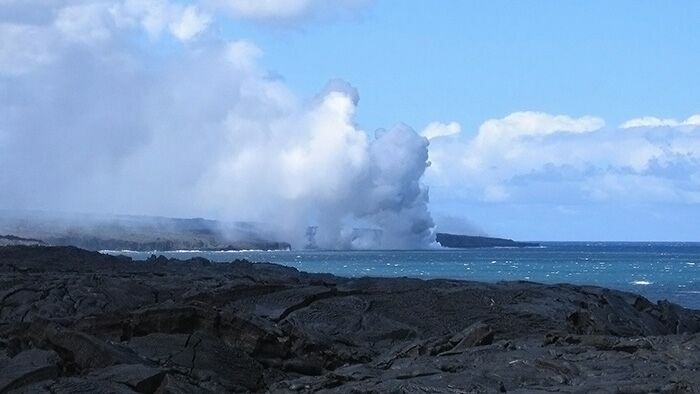 Except for the occasional vog, the main islands of Oahu, Maui, Kauai, Molokai and Lanai are unaffected by the volcano. And even on the Big Island, it’s business as usual. 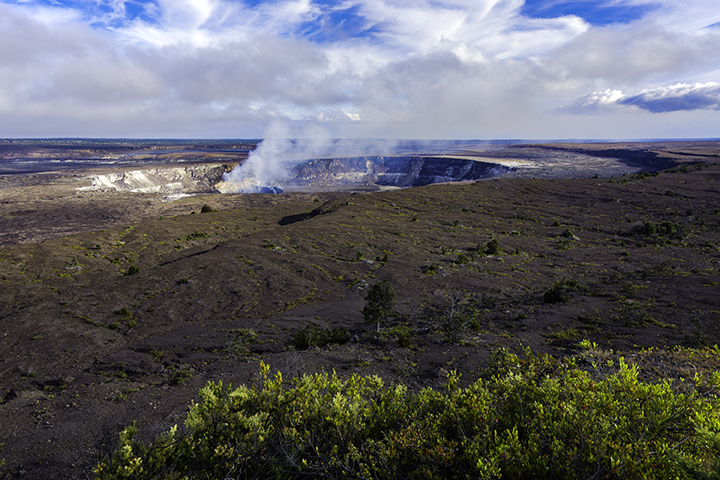 The only exception is Hawaii Volcanoes National Park, the Puna District and nearby areas. So don’t let this recent volcanic activity hold you back from your travel to Hawaii. 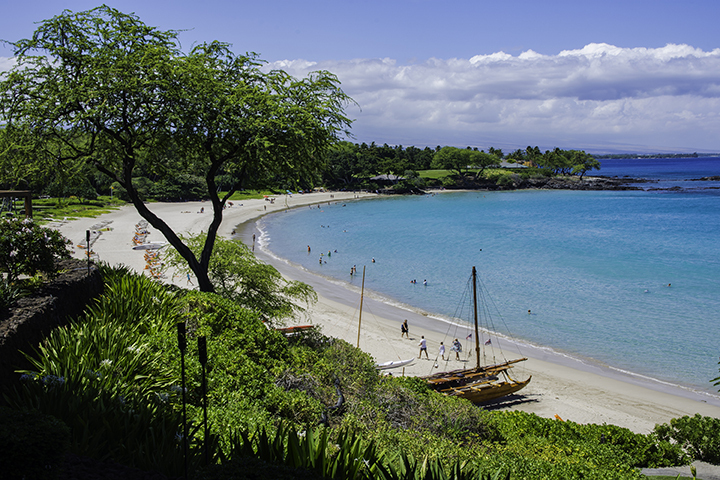 At Mauna Kea Beach on the Big Island, it’s business as usual.